This is a rich chocolate dessert with a specific taste of peanut butter which can be eaten just in a bite. Your cravings for chocolate can be satisfied as you pass by the bowl full of this incredible smooth treat. 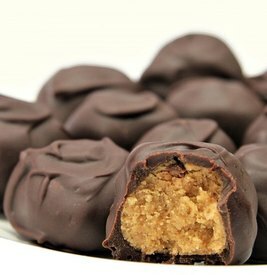 This recipe from Yummiest Bites has a delightful mixture of peanut butter and graham cracker in the center covered in decedent chocolate!